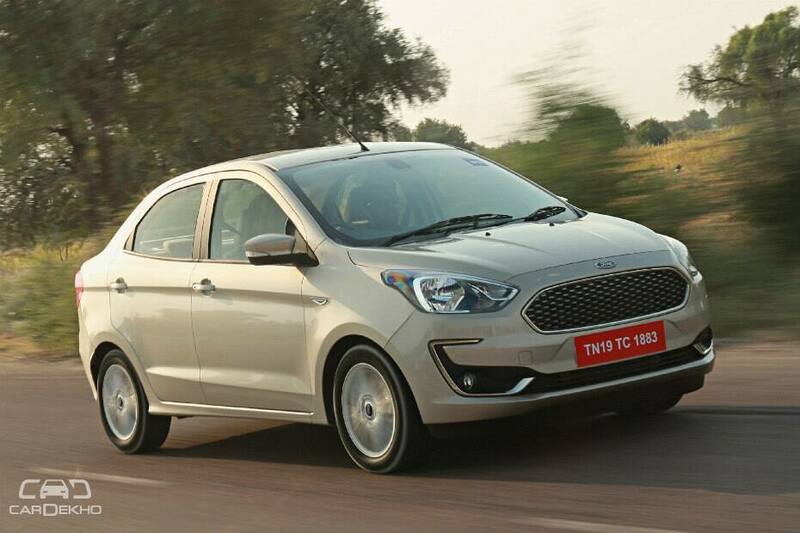 Priced from Rs 5.55 lakh to Rs 8.49 lakh (ex-showroom), the 2018 Ford Aspire gets a facelift and some updates to take on its subcompact sedan rivals like the Honda Amaze, Maruti Suzuki Dzire and Hyundai Xcent. It’s bigger sibling, the Ecosport is a subcompact SUV which is priced from Rs 7.82 lakh to Rs 11.89 lakh (ex-showroom). Yes, the two cars are very different, but since their prices intersect at some level, we’ve pitted them against each other to see how few or how many comparisons can be made. A sub-compact sedan: The Aspire is a three-box sub-compact sedan which offers more luggage space than its hatchback cousin, the Figo. With an overall length under 4m, both the Aspire and EcoSport are nearly the same size as far as dimensions go. A sub-compact SUV: With its sub-4m length, rugged looks, high seating position and increased ground clearance, the EcoSport falls under the sub-compact SUV segment. Like the Aspire, it can seat five people. The EcoSport offers a 352-litre boot, while the Aspire offers 359 litres. Smaller 1.2-litre petrol engine option, no EcoBoost: Two new 3-cylinder petrol engine options are now offered in the Aspire - 1.2-litre unit from the Freestyle paired with a manual transmission and the 1.5-litre from the Ecosport with the 6-speed AT. The 1.5-litre diesel option remains unchanged and is restricted to a manual gearbox. 1.5-litre petrol & 1.0-litre EcoBoost: The 1.5-litre petrol engine in here is available with both the 5-speed manual and 6-speed AT options. There is also the 1.0-litre EcoBoost turbo-petrol engine for a little more power and fuel efficiency while the 1.5-litre diesel is common to both. Better fuel efficiency: While both are sub-4m in length, the Aspire is lighter. Even with the shared engines, the compact sedan offers better fuel economy. The Aspire is claimed to deliver 16.3kmpl for the 1.5 petrol-AT combo and 26.1kmpl with the 1.5 diesel-MT. 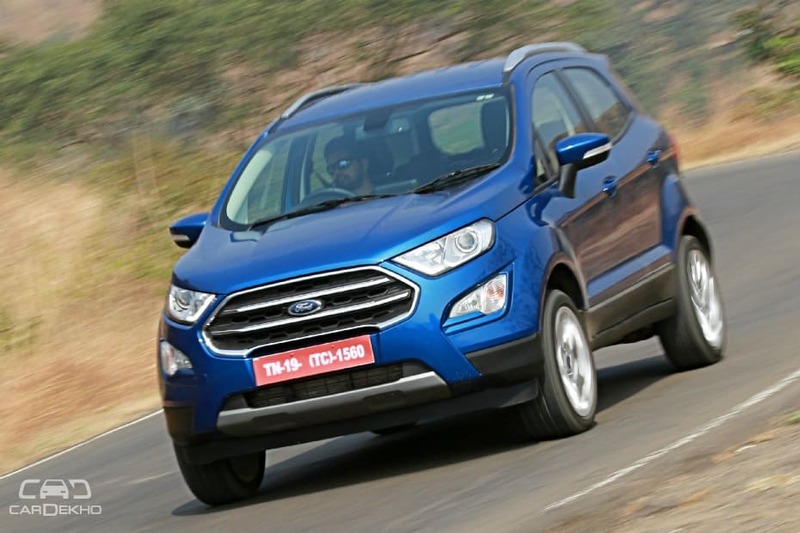 In comparison, the EcoSport is rated to deliver 14.8kmpl and 23kmpl with the said powertrains, respectively. EcoBoost engine for performance: In the S variant, the 1.0-litre turbo-petrol engine offers better performance and fuel economy. As per ARAI tests, it can return 18.1kmpl as compared to the maximum possible 17kmpl with any 1.5-litre petrol variant. But the benefits come at a premium. 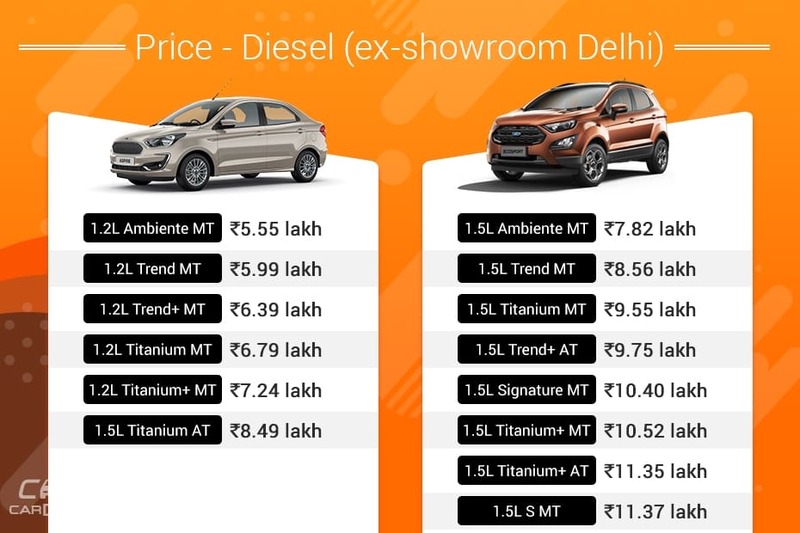 Using price as the deciding factor for the most relevant comparison, we have selected two petrol variants and one diesel. 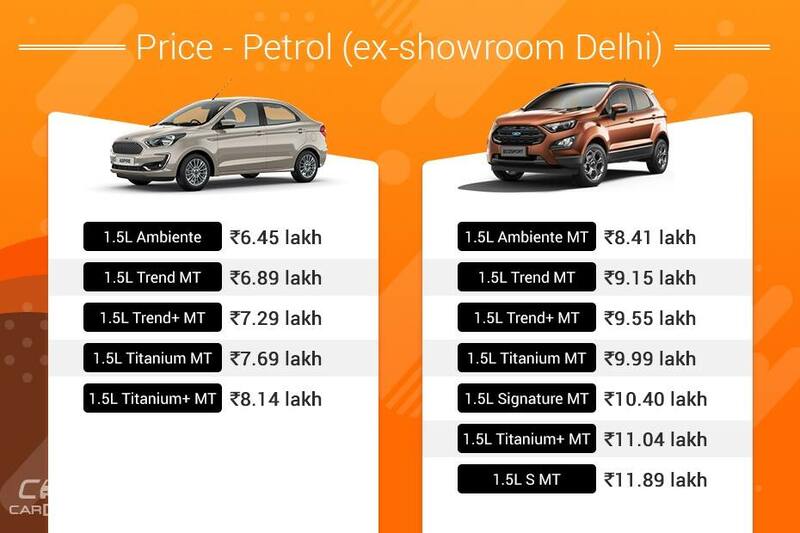 For the petrol variants, we’re comparing the 1.5L Titanium AT Aspire priced at Rs 8.49 lakh with the 1.5L Trend MT EcoSport which costs Rs 8.56 lakh. 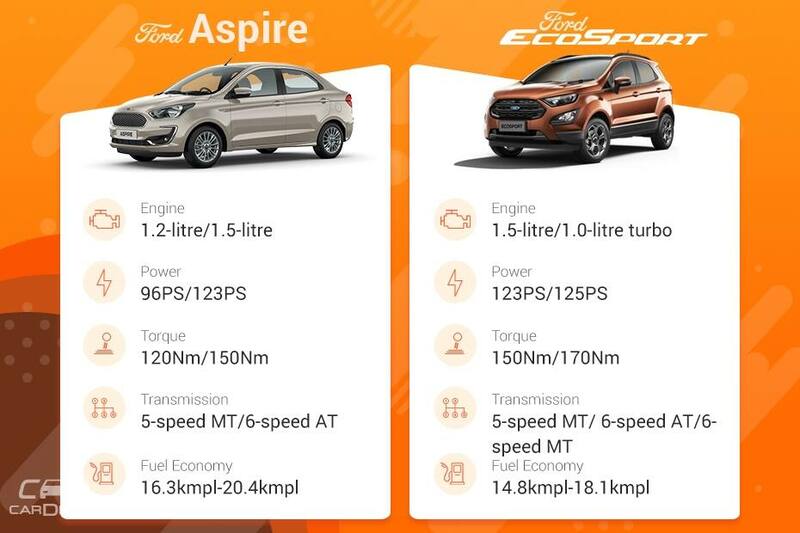 The second petrol engine comparison is between the Aspire 1.2L Titanium+ MT which retails for Rs 7.24 lakh and and the EcoSport 1.5L Ambiente MT, priced at Rs 7.82 lakh. On the diesel front, it’s the top-spec Aspire 1.5L Titanium+ MT priced at Rs 8.14 lakh, against the entry-spec Ecosport 1.5L Ambiente MT priced at Rs 8.41 lakh. Between all the other variants for each, the difference in price is too high. Verdict: Given that we’ve compared a higher-spec variant of the Aspire to a lower-spec EcoSport, the sub-compact sedan does get more features and is slightly less expensive as well. Additionally, there’s an automatic transmission as well that should make for a more convenient drive. In conclusion, the new Aspire is more value for money than the EcoSport among the variants compared. Telescopic steering adjustment and a device dock on the central console. It does have the bigger 1.5-litre petrol unit which has more power and torque (27PS and 30Nm more). Verdict: The new Ford Aspire 1.2L Titanium+ MT is a clear winner over the EcoSport 1.5L Ambiente MT, both of which are priced similarly. 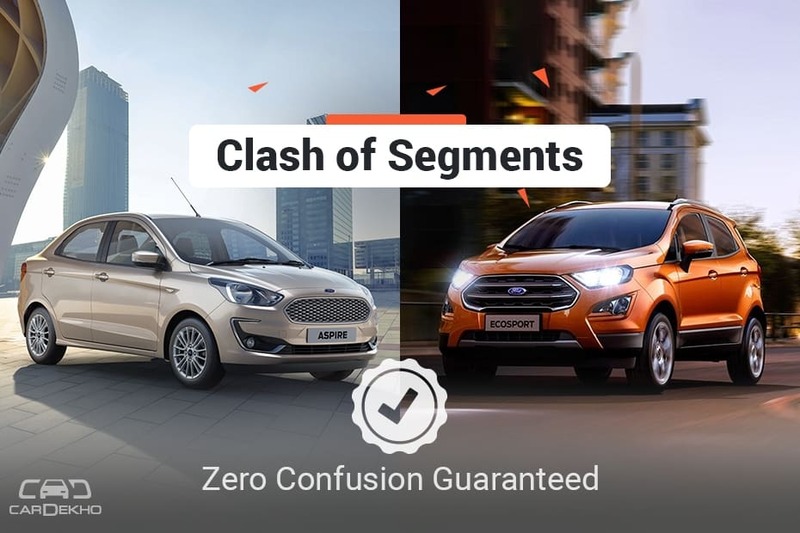 The sub-compact sedan is loaded with all the features in this top trim and the smaller engine will also offer better fuel economy than the entry-level trim of the EcoSport. Automatic headlamps, automatic air conditioning, rain-sensing wipers, electrically folding and adjustable ORVMs, rearview camera, steering-mounted audio controls, two USB ports in front, 6.5-inch touchscreen infotainment display that supports SYNC 3 with voice control, Android Auto and Apple CarPlay, emergency assistance, side and curtain airbags, driver seat height adjustment, rear seat center armrest, push-button start. Telescopic steering adjustment and a device dock on the central console. Verdict: In the diesel variant too, the Aspire again edges past the EcoSport. 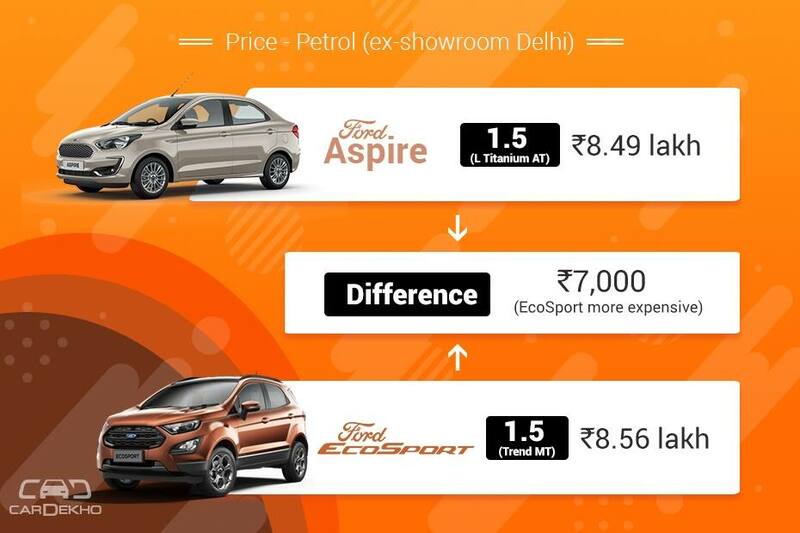 For less money, you get more features on the Aspire as compared to what you get on the similarly priced EcoSport. In fact, the Aspire 1.5L Titanium+ MT and the EcoSport 1.5L Ambiente MT even get the same powertrain. Value for money: For a price of less than Rs 9 lakh (ex-showroom), the Ford Aspire now offers a whole lot of features in terms of safety, entertainment and even comfort in comparison to the EcoSport. Fuel efficient: The new 1.2-litre petrol engine also makes an excellent case for itself in terms of fuel economy as does the 1.5-litre diesel engine. Most powerful petrol engine in segment: Both of Aspire’s petrol engine options offer more power and torque than all of its fellow sub-compact sedans. The 1.2-litre unit makes 96PS and 120Nm, while the 1.5-litre unit makes 123PS and 150Nm and also gets the 6-speed automatic transmission. Road presence: Yes, the EcoSport is less than 4m long, but its rugged design and perched up cabin give it an impressive stance. All this, without being too much of a hassle, even on narrower roads. Performance and usability: This sub-4m SUV gets the same diesel engine as the Aspire and even shares the same petrol automatic engine variant. But the EcoSport also gets the 1.0-litre EcoBoost turbo-petrol engine that packs a little more power and torque (2PS and 20Nm more), while also offering better fuel efficiency in city. More features in higher trims: In the top-spec EcoSport that gets the EcoBoost engine, Ford also offers all the safety and infotainment features, along with goodies like 17-inch alloys and an electric sunroof. It all comes at a significant premium over the Aspire of course, but you do get a lot more car for it. The EcoSport offers plenty of range as well with a 52-litre fuel tank. Given its claimed efficiency, the diesel variant could cover over a 1000km before needing a refill.